Grain elevators across mid-Missouri have been struggling to handle the incoming waves of grain from a bumper harvest. Local elevators and co-ops have had a tough time not only storing corn and soybeans, but also transporting it for processing or to market. It is the first time since 2004 that corn and soybeans together have exceeded storage capacity in Missouri, said Bob Garino, the Missouri state statistician for the National Agricultural Statistics Service in Columbia. Grain elevators only have so much space, and when they reach capacity farmers must resort to their own on-farm storage or wait until more space is available to harvest their crops. Early predictions of a record corn crop came true as the 602.7 million bushels in 2014 eclipsed the previous record of 466.6 million bushels in 2004, according to the USDA Missouri crop forecast for November. The 2014 estimate is 29 percent higher than 2004. A record soybean crop is also expected with 252 million bushels, which breaks the old record of 230.6 million bushels. “Typically in Missouri there is rarely all good crops across every region, but we can’t find a problem area,” Mitch Dawson, director of grain operations for MFA Inc., said. A longer harvest, delayed in part by October rains, has given more time for the grain to move through the system, Dawson said. If harvest wasn’t hampered by the rain, he believes problems with storage would have been worse. 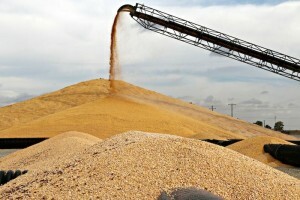 Missouri’s grain storage infrastructure is not set up to handle the year’s high yields as well as states such as Iowa or Illinois, Dawson said. In Missouri, there is usually more variability in yields, he said, and this year Missouri may rival Iowa in bushels per acre yield. Earl Haller, manager of the Pilot Grove Co-op, built temporary storage outside the co-op’s elevator in the summer in expectations of a large harvest. These outside storage areas gave the elevator, licensed to store 2.1 million bushels, space for an additional 750,000 bushels of corn. Pilot Grove also added a bagging machine that places grain in 300-foot long polyethylene bags as short term storage that protects the grain from the elements. A bag holds about 10,000 bushels of corn, and 9,200 bushels of beans, he said. Haller said about 30,000 bushels of beans have been going into the bags each day. Even with earlier planning, it’s proven difficult to keep up with the record yields. “The best thought-out plans aren’t working now,” Haller said. The Pilot Grove Co-op is not alone in the crunch. “We are still fighting for storage space every day,” said John Graverson, grain department manager of Ray-Carroll Cooperative. The cooperative is based in Richmond with nine other locations in Missouri and a grain terminal in St. Louis. Graverson said they have four ground piles of corn at three different locations that amass to 3.5 million bushels. The MFA elevator in Centralia has tried to manage by leasing a grain bin in Moberly and keeping grain flowing to avoid constructing temporary storage, manager Jim Gesling said. He said their elevator has been at capacity for short periods of time this fall. When the MFA elevator at Glasgow reached capacity recently, it was only able to take in grain that was contracted in the spring or early summer, grain originator Nathan Oglesby said. Glasgow has 900,000 bushels of corn on the ground with temporary storage bunkers, he said. Their licensed storage space is at least 2 million bushels, Oglesby said. Rail and freight transportation also has been difficult to come by for elevators trying to move grain off-site. At Centralia, Gesling said his elevator used 250 rail cars during the bumper harvest of 2004 but this year have been able to use only 10. Gesling said trucking prices have increased this year from 20 to 70 cents a bushel. Elevators have hired independent truckers to help. Elevators at Glasgow and Centralia have turned to using barges on the Missouri River for the first time in more than a decade. For Centralia, they have been able to move 50 to 55 thousand bushels of beans with the barge, Gesling said. Even though problems persist in keeping up with storing and transporting grain, it has been a banner year for farmers and others in the grain industry. Harvest is in its final stages. As of Nov. 9, the NASS crop progress report had 86 percent of corn and 81 percent of beans harvested, Garino said.